This is a variation listing with several options to choose from including Switch type, Colour and Gang/Way of the switch. Please see the table below to help you decide which switch is the most suitable for you. 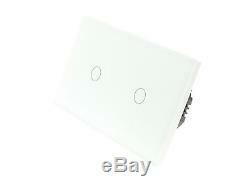 These switches are LED compatible as well as all Halogen bulbs and fittings. The Switch has a blue back light for each Gang which makes it visible in the dark making it easier to find your switch at night. All I LumoS Products are Designed and Assembled in the UK. I LumoS TM is a trademarked product and is available to be used in all rooms of your home, business and establishment. The I LumoS range compliment your home with a unique and luxurious style that will bring your home into the 21st Century. I LumoS switches are all manufactured with Crystal Glass Panels that are operated by Touch with a very unique and high quality Glass Fascia that makes your switch stand out in any surrounding. The unique design removes the need for the traditional button light switches that bring a modern and stylish look to enhance you property. Below is a list of Available I LumoS Switch types. Note: I LumoS 2 Way Switches can only work with another I LumoS 2 Way Switch and will not work with Mechanical Switches. I LumoS 2 Way Dimmer switch must be connected to another I LumoS 2 Way Dimmer Switch. A 2 Way Dimmer cannot work with a 2 Way On/Off by design. 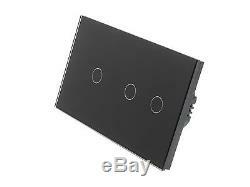 All I LumoS 2 Way Switches can also be used as an intermediate switch to create a 3 Way and 4 Way system. I LumoS light switches are compatible with most LED light bulbs, including GU10 bulbs and can work with as little as 3 Watts up to 700 Watts per Gang. 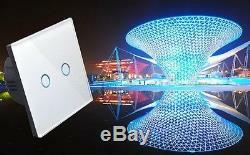 The switches are also suitable to be used with all halogen and fluorescent light bulbs. The switches can also work with LED lights bulbs as low as 3 Watts with the use of our LED adapters which will be provided free of charge if needed. Our LED adapters are designed to eliminate flickering in 99% of flickering issues. Please note that if the adapters are required they are not needed for all LED lights, only 1 per circuit. 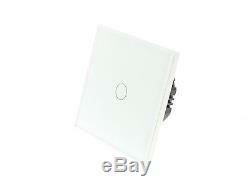 All Remote & WIFI/4G Touch Switches come with a free Remote Control with every order. 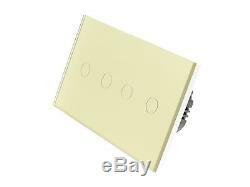 Our Switches are of the highest quality that will face any condition used in. The Switches are made from a high quality Glass Fascia that can work under 97% Humidity levels, which makes it ideal for use in bathrooms. Our beautifully designed fascia covers the electronics of the switch and with it's Glass Touch Panel makes it impossible to conduct any electricity. As the switches are all electronic with no moving parts or rockers there is no buzzing noise when dimmers are used. The Voltage and frequency capabilities of the switches ensure that the switch can be used all over the World in any country. The Broadlink RM PRO Device lets you control more than just your I LumoS WIFI Remote Switches, it allows you to control any Infrared Device in your home such as your TV, Air con, Music System and any other remote controlled Device. 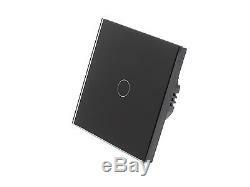 The Broadlink has an Omni directional Infrared controller that will work in any part of the room. It also has a Radio Frequency controller that can learn any remote button on the same frequency. With its stylish looks and ease of use and installation Broadlink RM PRO will bring comfort and control into your life. Once the Broadlink device is connected to your home WIFI you can control your lights from anywhere as long as you have an internet connection via 3G or 4G. This gives you the comfort of being away from home and still having full control of your house. Subject to your WIFI coverage you will only require 1 Broadlink device per household to control all WIFI compatible I LumoS Light Switches. All instructions for installing and pairing the Switches to the device will be provided. The App is available for both IOS and Android based devices free of charge. The Device are available in UK, EU & US Plugs. The item "I LumoS Modern Glass Panel Touch, Dimmer, Remote and WIFI/4G LED Light Switches" is in sale since Wednesday, June 21, 2017. 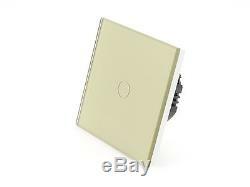 This item is in the category "Home, Furniture & DIY\Lighting\Light Fittings". The seller is "hartingtonheath" and is located in London. This item can be shipped worldwide.